Relamping may sound exotic, but it is the most basic part of lighting maintenance. It is the first thing people suggest when a light starts to flicker and burn out, and it is the most efficient way to maintain lighting in your facility. Here are the basics. The Dictionary of Construction defines relamping as "the replacing of bulbs in light fixtures". This is harder than it sounds, especially since many commercial and industrial establishments have light fixtures in spaces that are hard to reach. Relamping also includes proper disposal of the old bulbs. If an establishment wishes to maintain a LEED or similar environmental certification, the bulbs will need to be recycled. 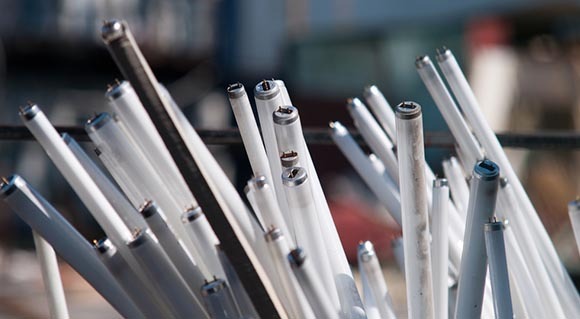 In fact, the EPA requires that all florescent lamps be recycled in a specific fashion. Finally, good light maintenance includes wiping down fixtures with electrostatic cloths to prolong the lights. Proper lighting is positively correlated with safety, retail sales, customer satisfaction, employee satisfaction, manufacturing production and many other important business metrics. Lamp surfaces and fixture parts degrade over-time, collecting dirt, dust, and insects over and inside the fixtures. The result is uneven lighting, with bulbs burning out entirely and many lamps producing discolored, weak, or flickering light. Also, routine relamping is an opportune time to check for failed ballasts and broken lamp holders to ensure 100% illumination. There are institutions that replace lamps only when one burns out, but manufacturers and professional associations recommend scheduling regular group replacement. Individual replacement can wind up wasting labor and actually increasing cost in the long-term. As mentioned before, dirt and general decay degrade light output long before bulbs burn out. If you do set-up a schedule, you will have to take into account the type of lamp and on/off cycles when deciding when to replace your bulbs. Manufacturers suggest replacing them when they have reached 60 to 70% of their rated lives. For traditional linear florescent lamps, this will mean once every 4 to 5 years. Newer types of lamps have longer lives and some industries don't require turning lights on and off a lot. A lighting maintenance professional can help you conduct a lighting assessment and determine a suitable schedule (or help to determine if an energy-saving LED upgrade would be a strong alternative to consider). They can also check for fixture damage, replace failed ballasts, recycle bulbs, and track warranties and incentives. This can save you money in the long run and keep your facility must productive. If you feel that your establishment requires relamping, contact us. We have 81 years of experience, including some of the largest facilities on the eastern seaboard.